Wow. Just wow. 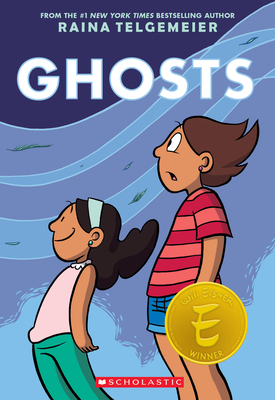 Embracing anxiety, a move to a new community, life-threatening illness, and more, Telgemeier uses magical realism to give us an absorbing, moving, and thrilling graphic novel for middle graders. Sixth-grader Cat’s family has moved from Southern California to a gloomy town up the coast for the sake of her younger sister, whose cystic fibrosis made it hard for her to breathe in the drier climate. Cat’s anxious and resentful, but also guilt-ridden – she knows that her sister’s life hangs in the balance. Their new community is deeply into ghosts and the Day of the Dead; Cat and her sister are drawn into the celebration and their own Mexican heritage. You’ll want to devour the book at one sitting, but go slowly enough to savor the artwork and process the subject matter. Raina Telgemeier is the #1 New York Times bestselling, multiple Eisner Award–winning creator of Smile and Sisters, which are both graphic memoirs based on her childhood. She is also the creator of Drama, which was named a Stonewall Honor Book and was selected for YALSA’s Top Ten Great Graphic Novels for Teens. Raina lives in the San Francisco Bay Area. To learn more, visit her online at www.goRaina.com.